15 AprAre You Covered For Damages Which Result From An Uncovered Loss? 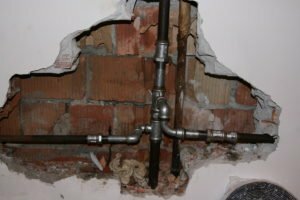 Recently, I received a call from a client who said they had a pipe break in their home. Like many homeowners, he immediately called his insurance company to report the claim. He told them an old plumbing line in his home broke and caused a water leak. The insurance company told him that, unfortunately, his policy doesn’t pay for damages as the result of wear and tear. He said thank you, hung up the phone, and contacted me. Technically, the insurance company here didn’t lie. The policy does exclude wear and tear damage. However, what they left out was that the policy did cover for ensuing losses, so long as they ensuing loss is not otherwise excluded. In other words, the pipe itself is not covered, but the water damage as a result of the break, is. This happens all too often in the insurance world. People will call in a claim on their own, be told a partial truth, and assume the insurance company is being open and honest, like a good neighbor. People think they really are in good hands. The fact is, the insurance company does not want you to make a claim, they do not want to pay for a claim, and if they do have to pay, they want to pay as little as possible. There is so much more covered by your policy than you probably realize. So what can you do to avoid being told there is no coverage when there is? Contact a trusted public adjuster BEFORE you call your insurance company. If you don’t know a trusted public adjuster, you can look here. Or, just give me a call, and I will help you personally, whether than means helping you find an adjuster, review your policy, or working with you on the claim myself, I will do anything I can to help. Don’t let your insurance company get away with telling you that you don’t have coverage even when you do. We can help. Click here to connect with an attorney at Wheeler, DiUlio, & Barnabei.